The Spring Training season is five games old and the Dodger-Giant game from yesterday was critiqued and reviewed in San Francisco with great interest. This was primarily because it was Tim Lincecum’s first trip to the mound this spring. Lincecum, who spent the off season working on his conditioning and overall image all the way down to his haircut, is of great concern to the organization. 2012 was by far his worst campaign in his six year major league career. There was a significant reduction in his velocity, a lack of command, a propensity to fall behind in counts and increase on giving up the long ball. Whether it was mechanics or simply that he is physically deteriorating after five amazing seasons, it is hard to pinpoint. It is safe to say that Tim is currently pitching for his life. Lincecum will earn $22 million this season, the final year of a lucrative 4 year contract that has paid him $41 million the past three years. He will be a free agent following this season. A good year could result in another eight figure deal. A fantastic year might land him a 5 year $100 million deal. If he tails off again this year, look for Lincecum to be a bargain for somebody that will be free agent shopping in 2014. 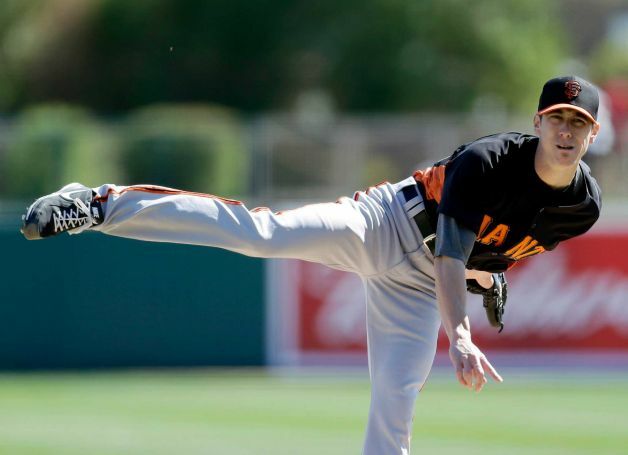 It’s hard to gauge things this early in Spring training and Lincecum will toe the rubber eight or nine more times before opening day, but it will be interesting to see how he progresses. Tim fully understands the implications this season will have on the rest of his career. Dodger fans know that the pennant race will be much more difficult with a steady Lincecum added to the San Francisco rotation. The “hated ones” will be a formidable opponent and the ball club to keep an eye on throughout the year. Today's action featured the Dodgers heading away from CBR for the first time, out to Mesa's Hohokam Park, where they defeated the Cubs 11-7. Aaron Harang was touched up for four earned runs in his first inning of work before settling down and pitching a scoreless second inning. Alfredo Amezaga went 3 for 3 with two RBIs and Alex Castellanos hit his second homer in three games of action. Yasiel Puig went 2 for 3 and scored three runs as he continues to impress. His lone out was a long fly ball caught at the warning track a full 410 feet from the plate. Dodger pitching did not allow an earned run in the final eight innings of the contest as Belisario, Lowe, Guerra, Magill, Sanchez and Abreu finished off the game. Matt Magill was especially impressive as he struck out five batters in two innings of work. So far in two outings, Magill has yet to give up a run. 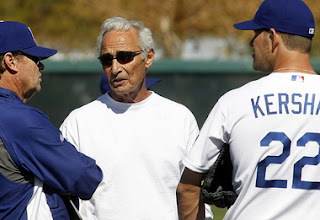 Initially I was thinking that Koufax may have assisted him, but Eric Stepehen at TrueBlueLA.com (LINKED HERE) reports that Magill still hasn't had an opportunity to work with Sandy, who still remains in camp, a full 12 days and counting. I write this while waiting to board my flight at Phoenix’s Sky Harbor Airport for home. It has been an exciting 4 days at CBR, and today was no exception. You never know what to expect at the Ranch. It was Monday, and a ho hum day for the most part. 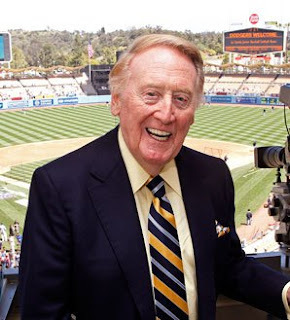 Yes, the Dodgers would have their first locally televised game meaning that Vin Scully would be present. But it was a Monday event. The weekend fanfare of so many Angelinos taking the trip east had worn off. When I arrived this morning, there were easily 75% less fans present. 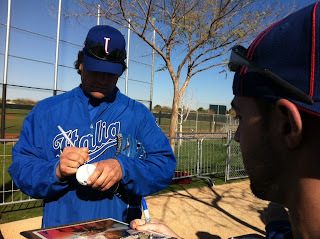 Then there is the World Baseball Classic’s Team Italy that has been present at the Dodger facility for days now. We all know that Mike Piazza is a hitting coach for that squad, but he wouldn’t possibly make an appearance at Dodgertown Glendale a week and a half after the release of he book in which he blamed Vin Scully for his falling out with Dodger fans in 1998. Or would he? Well, we got the answer. Mike did appear, and he slipped past many fans who had no idea that he was there. The few that recognized him asked him to sign and he said he'd get them on the way back, (whenever that would be). We had seen it all week. 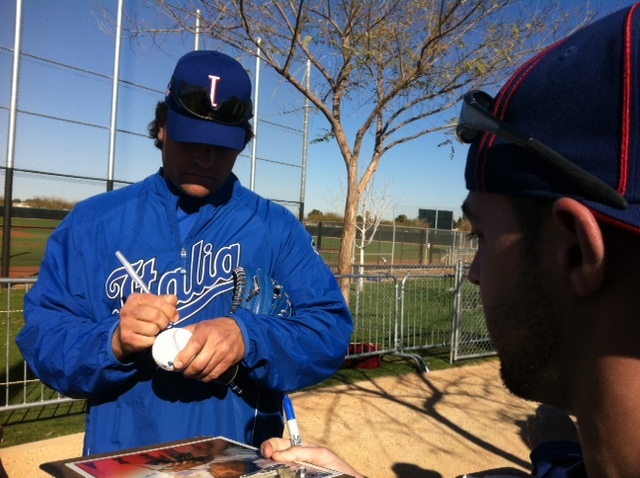 The Italian team members, made up primarily of minor league players from several organizations would slip past the fans with nary a inkling of attention from Dodger autograph seekers. 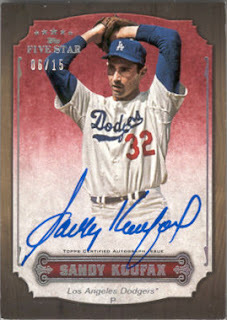 Fans were seeking out Hanley or Kemp, McGwire and Koufax. There was no interest in the Italian team, also wearing blue. So a group of us, slipped away from the game as the non-roster invitees and minor leaguers were inserted in the lineup in the late innings. We waited where the Italian team had to pass in order to enter into the Dodger administrative offices. At a few minutes before 4:00 pm, he reappeared and he kept his word, signing for a very positive group of Dodger fans, about ten or twelve. 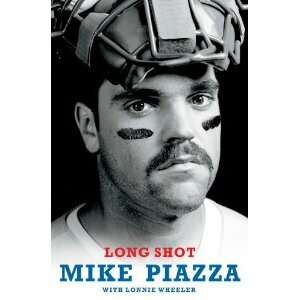 When one of the Italian coaches attempted to rescue him from the few fans seeking autographs saying, "Don't forget Mike, we have a meeting," Piazza told him he would be there in a few minutes after he finished signing. It was a great gesture from a player that had a short time ago expressed concern about ever returning to Dodger Stadium to be recognized, for fear of the possible boos. Piazza was cordial, polite and accommodating. He signed for most everybody and continued on his way. Did he see Vin Scully? Now that would be a real interesting scenario. I doubt it played out. Our Piazza/Lasorda ball. A great "get" at CBR. 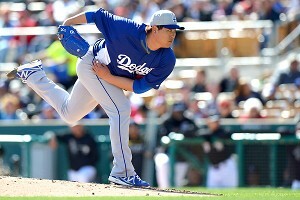 Hyun-Jin Ryu in his sessions with Sandy Koufax has been told that setting the ball deeper in his hand will result in a more effective curveball. If made sense to him. He’s been working on the pitch. 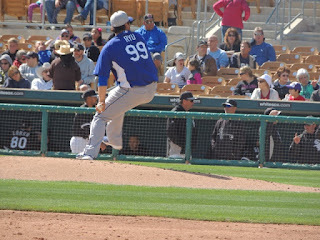 Here we are in spring training games now, and Ryu gave the pitch a shot. White Sox outfielder Dewayne Wise blistered it into the right field corner for a standup triple. Dee Gordon - feet first slides and bunting. Juan Uribe, Luis Cruz - patience at the plate and working the counts deep. (Note: this is something that each player has done in the first two games of action with somne success). Andre Ethier - improving his approach against left handed pitching and being able to take them to the opposite field. 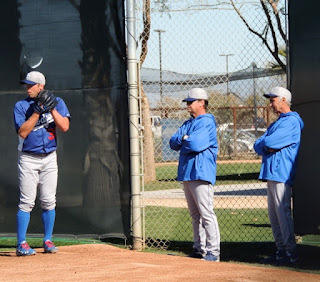 Chris Capuano / Ted Lilly /Aaron Harang - pitching on consecutive days out of the bullpen and developing a “one inning” mentality as relief pitchers. Today’s action at CBR begins at 1:05 pm against the Chicago Cubs. The Spring Training grind continues on with a lot of minor leaguers continuing to show their stuff. My annual sojourn to CBR ends today, as I return back to the grind at home. There aren’t a lot of positives to discuss in a 9-0 loss. But allow me to mention one. Yasiel Puig. 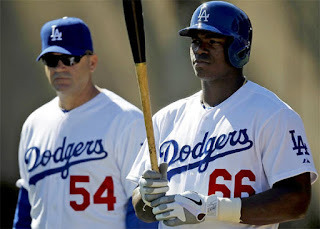 Puig was a player I was thrilled the Dodgers reached out and acquired this last season. Time has limited my research on international prospects as a part time blogger, but I had seen video of this Cuban defector. The footage was crude, but the talent displayed on it was evidently seen. This kid was a physical specimen. His bat had pop, his arm was strong, and his speed was impressive. Dodger scouts must have felt the same way because the Dodgers won out the bidding for his services with a $42 million offer for 7 years. Ned Colletti said in July, 2012 that “our people believe he’ll be better than Cespedes.” (At blogger night Q&A session, Dodger Stadium). That prediction remains to be prophetic, but what I’ve seen so far has made me a believer. He’s a legitimate 5-tool player. For two days I have seen him pound he ball in batting practice and today he saw his first game action. Puig grounded into what should have been a routine double play, but his hustle beat out the throw. He threw a dart in to second base on a single to right field that the Sox batter had inklings of stretching into a double. 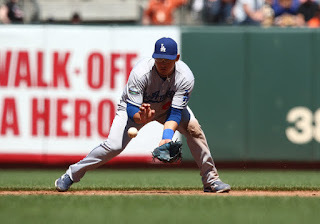 Then in his final at bat of the day, he hit a gapper into left center field and he motored around the base paths before Tim Wallach put the breaks on him as he rounded second, undoubtedly because the Dodgers were down 9-0 at the time. Puig is a keeper. A full year in the minors will provide the seasoning that he’ll need before being a prime candidate to take a starting major league spot. Who’s spot he’ll take is up for debate, but the problem is a nice one to have. There is no doubt that Puig could probably hold his own in the Major Leagues right now, but the wise move is to have him hone his skills in Chattanooga or maybe even Albuquerque. What few of us realize is that Puig spent a year away from the game altogether as Cuba punished him for a defection attempt earlier. Then last year, he dominated the Arizona League for a few weeks before being promoted to High A Rancho Cucamonga where he dominated as well. There are those that follow the Cuban Premier League game that rated Puig as the league’s top prospect in 2010-11. With a stat line that year of 327 ABs, 17 homers, 47 RBI and 78 runs scored. This young man was coveted by Major League scouts dating back to that time. The full story of his defection might never be known, but it was a scary ordeal and something that Puig doesn’t like talking about. The lone comments he has stated in some Spanish language interviews were that his escape was extremely dangerous and that once in Mexico, his precarious situation wasn't over as he witnessed some very violent episodes. Now, happy to be in the States, Puig is thriving. there are those that compare him to Raul Mondesi in his younger days. Those comparisons may be inaccurate due to Puig’s imposing size, (6'3", 250 lbs.) but his speed is comparable. His arm doesn’t seem to be as strong as Raul’s, but his power seems better. Heads turn when this man takes batting practice. Pitchers running in the outfield keep watch when he steps into the box for fear of the missiles he launches their way. Those fans heading to CBR this spring are in for a treat as they watch Puig display his talents. Enjoy it guys. A trip to see Puig is worth the travel and admission. I see him as having as high a ceiling as any player in the Dodger organization. Oh, and I almost forgot. He signs autographs for EVERYBODY. 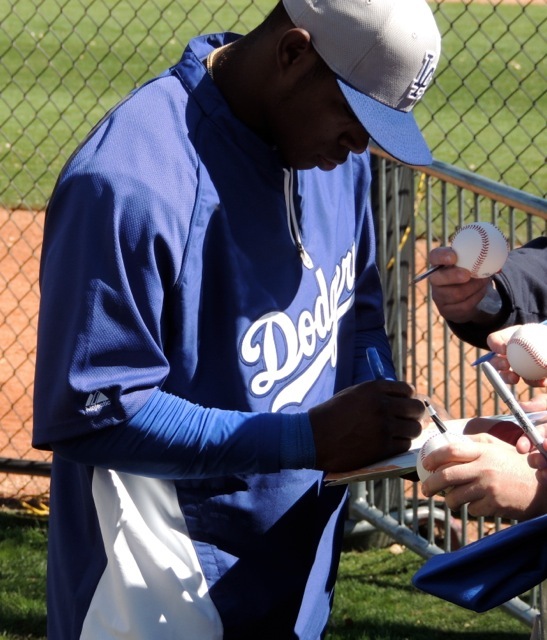 On Friday, Puig spent 45 minutes after practice signing for every single fan that patiently waited for his autograph. His interaction with fans is great and he enjoys the attention. So I made it to Camelback Ranch today. I got this great photo of Matt Kemp. Uh, I swear to you, he's behind that arm and hand. That is the hand of my son, who was attending his first Spring Training in 8 years. Needless to say, at age 23, he still gets excited at the sight of seeing his favorite player. Anyway, I believe that this is my 7th Spring Training. 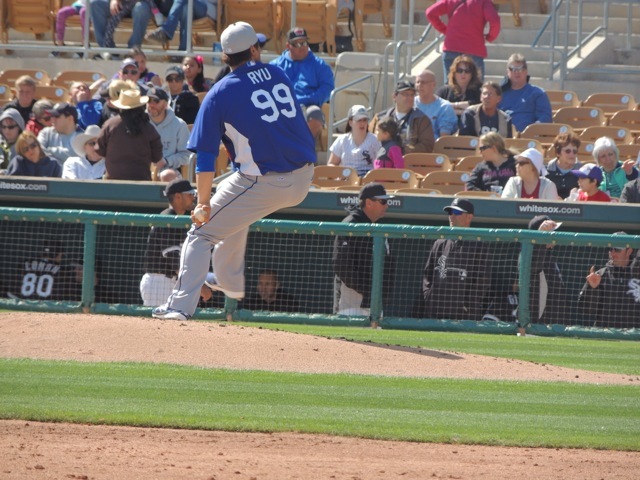 I know it's my 2nd at Camelback Ranch (CBR). I think I had more fun today than I have in a long time, because I got to watch my son get excited again. Just like it was in the old days. There's something special about getting the opportunity to interact and converse with players and coaches in this informal fan friendly environment. Though there was no game today and the guys were simply practicing, there is a noticeable increase in crowd size this year, and I think we can attribute much of that to the enthusiasm of the new ownership. There is also the Koufax factor as well. Photos I snapped from a distance of Sandy Koufax providing assistance with the pitching staff. So let me just say this, and it's a personal observation. There are a lot of twenty-something year old guys that are simply working on behalf of autograph brokers or in the game simply to buy and sell sports paraphernalia. These are the guys that will ruin the enjoyment of us real fans, that collect stuff, due to our love of the game and our team. 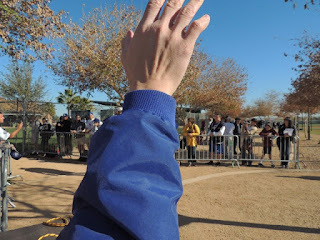 I watched my son stand in a line for a Don Mattingly autograph and saw 15 guys there with every piece of Dodger artifact under the sun that was prepped for a signature. 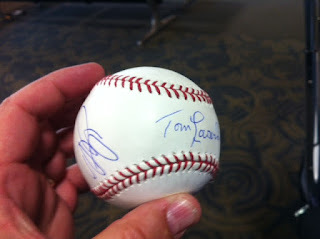 They are accompanied by a photographer that snaps a photo to authenticate the signature. This is a big business. Sadly, I think that one day these guys will go too far and force the Dodgers to change their open-autograph policy that makes their organization unique from the rest of baseball. The White Sox, (the other CBR co-tenant), were working out as well, but their operation is night and day when compared to the Dodgers. It's a ghost town over there. There is no access to their players. It's a stale environment and all business over there. That might be a good thing in the long run for an organization as distractions are brought to a minimum, but it sure doesn't make things very fun for their fans. When the Dodgers moved to Arizona, it was with a promise that the team would continue to allow the fans to have access to the players for autographs and interaction. That promise has been kept. What has resulted is that the autograph hawks and vultures have honed in on CBR. I watched Skip Schumaker chastise one of those hawks for cursing when he passed him by without signing something in favor of a child. Skip politely told the guy that he was inappropriate and that there were children present. The thing was, the autograph hawk wasn't even phased by it. It should have been an embarrassing moment for him and he just schluffed it off and moved on to the next player for an attempted signature grab. These guys are without feeling. They'll cut in front of you, children even, all for the almighty dollar. I see players like Clayton Kershaw who will rarely sign for adults, and who can blame him? I'm sure he has his reasons, but the autograph vultures have to be the primary reason why. Hey, I like a good autograph as much as anybody. I have a rather prominent collection of signed stuff that I have in my office at work. But I get more pleasure in handing a child a card of an approaching player and seeing him get that autograph. There are few moments more magical than that, seeing a child converted to Dodger fandom and connecting with a professional ballplayer. 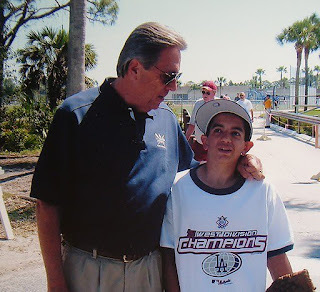 My son, Ev, posed with Rick Monday at Vero Beach in 2005. 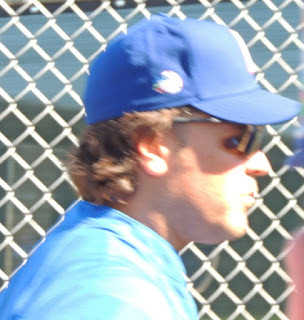 Today he returned to Spring Training for the first time in eight years. Years ago I'd take my son to games and he'd get his share of signatures. He developed his Dodger loyalty in those moments, something that I'm sure he'll pass on to his son, if and when that ever happens. Just as my dad passed the passion on to me. This sport is so much more than 60 feet 6 inches, working the count deep and double switches. It's about family, passion and fun. I was reminded of that today at CBR, I just hope the autograph vultures don't ruin it for all of us. My son talking with Mark Ellis today at CBR. If the Dominican Republic, Venezuela, Mexico or Italy finish in the top two in it’s pool, the next round of games take place in Miami at Marlins Park between the top two teams of each Pool. These games will run from March 12th to the16th. The top two finishers at Miami advance to the finals in San Francisco’s AT&T Park to be played on March 17th, 18th and the final on the 19th. Possible away time for those five will impact bubble roster players such as Dee Gordon, Alfredo Amezaga (who declined playing for Mexico in the WBC), and the entire relief staff. Reports from Spring Training thus far are positive regarding Hanley Ramirez playing shortstop, but game action won’t start until Saturday. This allows Ramirez to get in some exhibition game play at the position for about nine contests before departing for Puerto Rico, probably around March 3rd. With Ramirez slated to play either third base, (since Adrian Beltre dropped out) or DHing, he could possibly be away from the shortstop position for a full two and a half weeks. 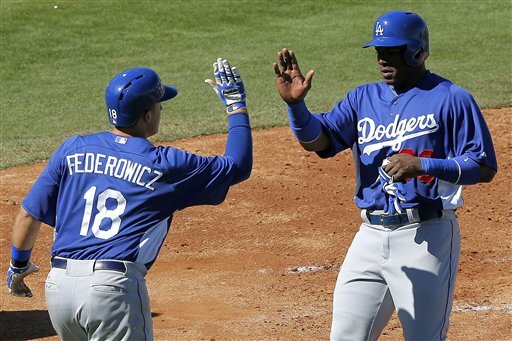 This will be ample time for Dee Gordon to slide in and prove that he can do the job. It’ll be a crucial time for Dee, who has yet to play solid defense for an extended period. Clutch players take advantage of an opening, and if Gordon has any prayer at making the ball club, he MUST dominate play during that two week window. Don Mattingly has already stated that Hanley will determine whether he is the starting shortstop, so he has to essentially play himself out of the position. But that possibility is real due to the fact that he won't be playing shortstop of a large time frame in the middle of Spring Training. His absence does not really help his cause. If Ramirez comes back from the WBC and starts kicking the ball around or throwing wildly, things could be very interesting. I don't think the temperamental Ramirez will handle Dodger Stadium boos very well either. This may be a recipe for disaster. I hope I'm wrong. With regard to non-roster invitee Alfredo Amezaga. He has an outside shot at landing a utility infield spot with the departures of Punto, Ramirez and Cruz. Amezaga is a crusty veteran and scrapper. He recently starred for Mexico in the Caribbean Series, so his head is in the right place by foregoing the Mexico WBC roster in an effort to crack the Dodgers top 25. He is my sleeper pick to make the team. The important thing for the Dodgers is that all these guys return from the WBC in healthy condition. 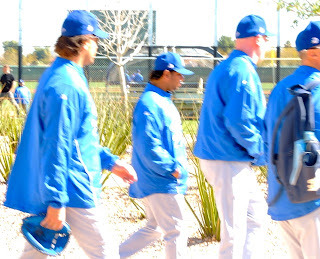 Year after year we see the casualties of injury during spring training that impact the Dodger roster. It'll be downright miraculous if the injury bug doesn't bite somewhere during these next 4-5 weeks. Colletti has plenty of players waiting in the wings to fill roles in that event. 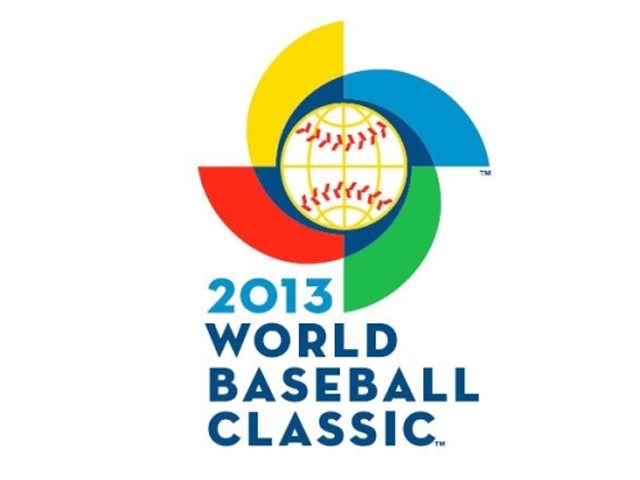 With the WBC added to the mix, the door opens up an inch or two wider for them. On my way to Camelback Ranch for four days. Couldn't get away from work any longer. I hope it's a lot warmer there! 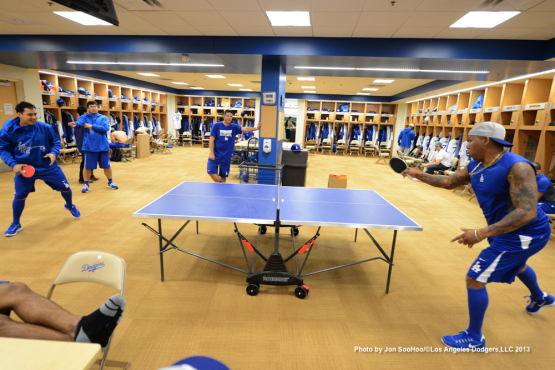 There’s not a lot to write about as the surprises at Dodger camp have already arrived. First it was Belisario who has been on his best behavior and finally understands the importance of being to camp on time. Then there was Billingsley who thus far is showing no signs of a significant injury so far. Photo day arrived and we saw a lot of pictures of guys that probably won’t be with the club beyond the day they break camp at the end of March. Nothing caught us by such surprise though than the arrival of Sandy K. to camp. We knew he was back to the organization, but on the first day that position players reported here he was. That was a quick arrival. The fanfare and excitement was to be expected. I think I somewhat understand Sandy’s reluctance to return to the organization. The jungle atmosphere that erupted when he arrived was precisely what he is uncomfortable with. His quotes from yesterday tend to hint that this return is a bit of an experiment, to see if he likes it. The way I interpret this is, Sandy likes the baseball part. He loves being around the guys and helping the kids out. It’s the attention he isn’t comfortable with. When all hell broke loose amongst the autograph seekers yesterday, I immediately started thinking that Sandy isn’t going to want to have to deal with that, and it might just drive him away. The camaraderie with his teammates. The achievement of an ultimate goal and becoming World Champs. That was something that Sandy lived for. So much so that he pratically gave his left arm away in doing so. Ira Green, the father of Shawn Green said it best, “How could people not understand this guy? He gave everything for his team. He gave up his career. He gave up his arm. He was unbelievably stoical in the face of it. Even his teammates had no idea how bad it was.” And it had to be bad. The man retired after a 27 win season and a 1.73 ERA The shock of it all didn’t really set in until after he retired, and how many of us thought...”Ah, he’ll come back. He’s only 30 years old.” It didn't happen because he seriously was on the verge of losing the use of his left arm. 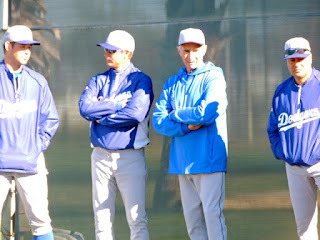 Many of us forget that Sandy was a roving minor league instructor with the Dodgers for 12 years from 1979 until 1990. That was a long time. He was a fixture at Spring Training and a valuable contributor to many championship team contributors. One thing that he has really enjoyed is the teaching aspect of the pitching craft. 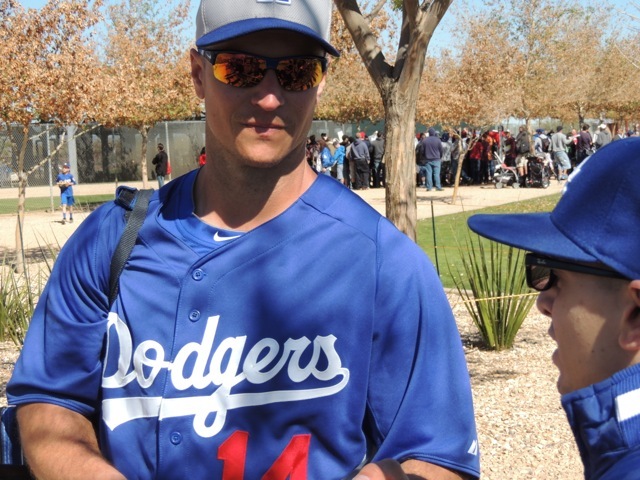 Even after ending his stint with the Dodgers, his appearances at spring training camps have been valauble and appreciated. Even if it was just one day. I’m pretty sure that he’ll be able to do that. I provided another guest post at Think Blue LA.com this morning. This one on the potential impact of Mark McGwire to the ball club. Take a look if you get a chance (LINKED HERE). I truly believe that if Dodger hitters buy into his program, this Dodger team will be unbeatable. I also discuss the often believed fallacy that Hall of Fame caliber hitters can't teach their craft to hitters with inferior natural talent. I almost forgot. Over at ThinkBlueLA.com, near the top banner, if you click on the "Forum" link, there's a great message board you should join that has some very passionate Dodger fans. The forum participants are baseball fans from all geographical regions and walks of life. 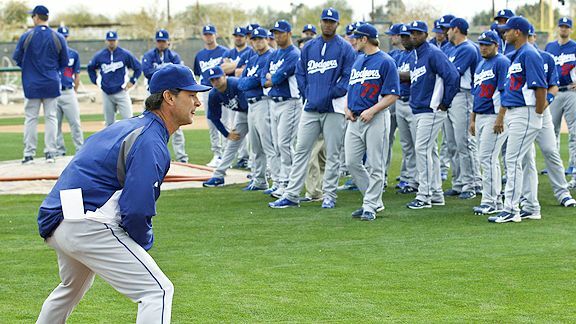 I'll be meeting up with some of them at Camelback Ranch this coming week and I really look forward to it. There has been a lot of talk about chemistry lately. Brandon Belt of the Giants says you can’t buy it, in reference to the Dodgers and their $200 million plus payroll. It was a rather dumb statement to make, but then again, he said it before thousands of Giant fans at their “fanfest,” so we know he was simply just preaching to the choir. Additionally, you have to believe that Belt didn’t fathom that his quote would make national headlines as it did. But lets look at the term “chemistry” a bit. I contend that winning often brings a healthy mix of chemistry. I also believe that there have been a lot of winning clubs that had awful team chemistry. 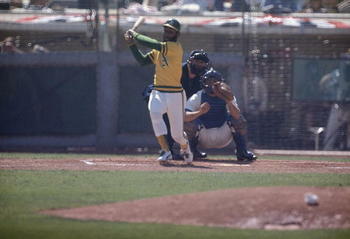 Take a look at the 1972-74 champion Oakland A’s. That mix of players hated each other at times, and they were a dynasty. Blue Moon Odom and Bill North punched out each other on a team bus. Reggie Jackson wrestled North on the locker room floor in Detroit. Ray Fosse threw out is back while breaking that one up. Odom and Rollie Fingers fought in the Dodger Stadium clubhouse before the first game of the World Series in ’74. There was one thing all Oakland players were unified about though. They all hated their cheapskate owner Charlie Finley. As a team, they put things together on the field and had not Finley been so cheap, they may have won a few more World Series championships. 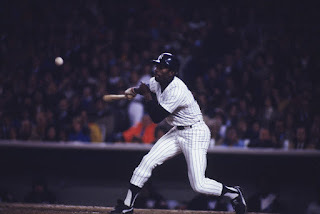 The Yankees in 1977 and 78 weren’t close to being a cohesive group. Reggie Jackson and Billy Martin feuded. Thurman Munson and Jackson were at odds with each other. Mickey Rivers, Graig Nettles, Roy White, King George the owner. There was feuding galore in that place. Sparky Lyle wrote a best seller, The Bronx Zoo, which aptly described that teams wild side. Chemistry-wise, the two time champion Yankees weren’t a very good mix, but they won. I won’t be foolish enough to say that clubhouse chemistry isn’t a positive element that helps clubs. In more cases than not, championship clubs get along, but clubhouse chemistry can also be overrated. In the examples mentioned above, those teams had some semblance of a positive cohesiveness, otherwise they couldn’t have pulled off the championships. If there is one thing that Don Mattingly has brought to the Dodgers the past two years, it has been a positive clubhouse atmosphere. Players have enjoyed their time under his tenure. They know that Don has their back. The pressure isn't unbearable under him. 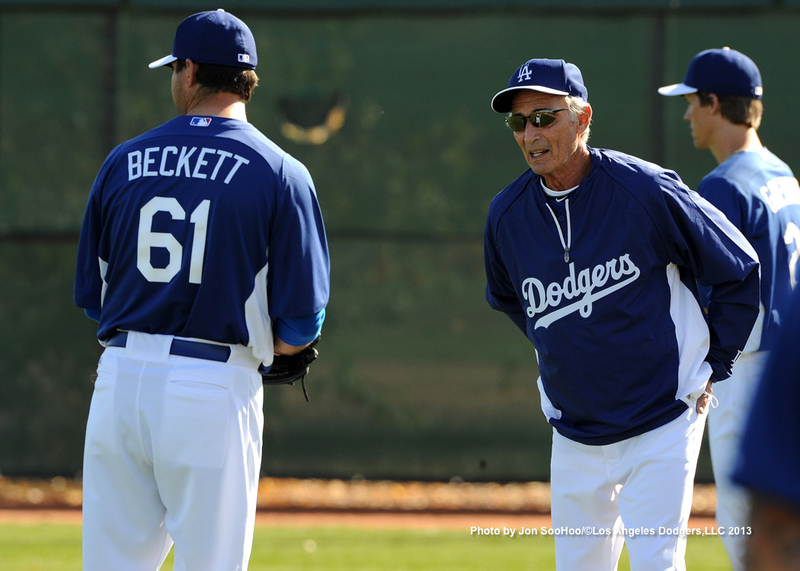 He understands what it's like to battle in the Major Leagues and he relates to his players. 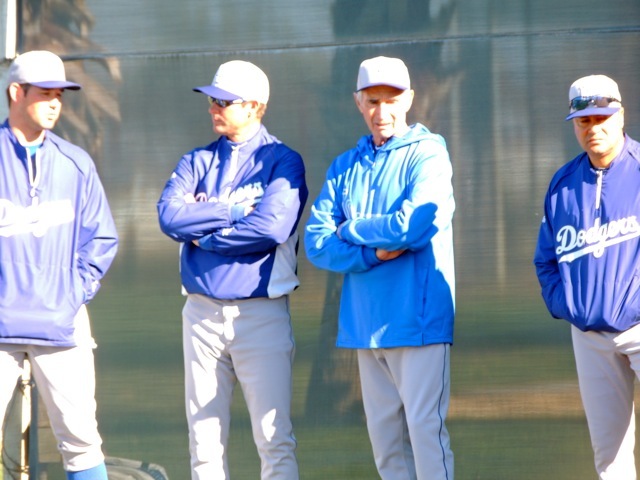 One thing that Mattingly knows is that a positive clubhouse usually provides better results. A division winner hasn't happened under his tenure, so there are those detractors that believe that the jury is still out on his managerial abilities. His staff of Wallach, Hillman, Lopes and now McGwire aren't the types of coaches that are high strung and place additional pressure on the ball club. Maybe that is the point to stress here. Things may be too lax in this clubhouse. Is it possible to actually be too comfortable and lack the necessary intensity to win? There was a time when the Dodger team, in the not too distant past had its cliques and divisions. Grady Liddle had no lid on the tension that developed during the Kent/Gonzo vs. Kemp. Ethier. Loney factions. Joe Torre's coaching staff with Bowa and Shaeffer didn't handle the younger players well either. This club is an easy going group that is on the same page, and that's important. But as I said before. Winning solves a lot of problems. If this ball club breaks out of the gate on a tear and wins 20 of their first 28 or 30 games, there will be very little talk of chemistry issues. No one will care about how much time they spend together playing cards in the clubhouse or who is going out to eat with each other. Winning cures all. I watched Piazza return to Dodger Stadium as a Met where he received a Standing ovation in his first at bat. I wrote about that event a year ago, LINKED HERE. I then watched him homer in his second at bat that same day as he drilled a home run to left center. Then the unthinkable happened. The crowd stood and applauded. Yes, they applauded an opposing player hit a home run against them. It was a first time I had witnessed that and I don't believe I'll ever se it again. Yet today, Piazza chooses to only remember the boo birds that serenaded him in his last days as a Dodger when he openly criticized the team and he was stinking up the joint for a good period of time as the season started. It was a terrible time to be a Dodger fan. The whole thing never should have happened, but there was a combustible emergence of several parties that screwed the whole thing up. You had New Dodger ownership under Fox trying to make a splash into MLB. You had Yankee fan Chase Carey of News Corp. undermining Dodger G.M. Fred Claire and making deals out from under him. There was Tommy Lasorda in a ceremonial position that kept him away from the decision making of the day. There was a coaching staff under Bill Russell in flux, as the Fox regime looked to put their own men in power. Then there was Mike, who won’t admit it today, but it was quite common knowledge that he wanted the first $100 million contract. When Piazza was traded in ’98, he had become a distraction. The deal was still terrible and it should have never happened, but there were no calm heads in place to peacefully resolve the situation. What never happened was Vin Scully talking about the situation or giving his opinion. Did Piazza expect Scully to take his side and let the world know that over the air? Perhaps Piazza believes that Scully could have done that, but that’s not Vin. He announces with pure impartiality and to his credit, he never said anything disparaging towards either side in that situation. I listened to Vin Scully call every game in 1998 and NEVER did he ever criticize Piazza during that turbulent time. That’s not his demeanor. That’s not in his character. Vin Scully is about as fair as anyone you could find. If I was on trial, I’d want Vin to be the jury foreman of my case. The man is split down the middle and if he does have an opinion, he’s not going to make it public unless there is no doubt whatsoever that what he is saying is dead-on accurate. We receive word today that the Dodgers asked Piazza to return and receive a bobblehead doll and he refused because he didn’t want to get booed. Well, Mike. I have news for you now. You have assured the fact that you will be booed now whenever you decide to return to Dodger Stadium and it’s of your own doing. Placing the blame on one of the most saintly of men breathing on this earth is about as dumb a move as removing wrestling from the Olympics. Vin Scully is about as humble and honest as any person that’s in baseball. He goes out of his way to not be judgmental in his broadcasts. At times when Barry Bonds was his absolute worst, Scully never said anything negative about him, and it would have been so easy to do so. During the worst days of the McCourt regime, Vin remained quiet on the subject. Scully knows what is appropriate for his audience. He exudes class. And to this day, as reporters question him about that turbulent time in 1998 and the comments in Piazza's book, Scully is confused by them. He told Bill Shaikin, "I have no idea where he's coming from...I can't imagine saying something about a player and his contract. I just don't do that ever. I'm really flabbergasted by that reference." To read more on the Piazza fiasco, take a look at Bill Shaikin's LA TImes article that addressed the topic today. I’ve got this dilemma. It’s one that has forced me to hold my tongue. One that has me ignoring that heated rivalry. A situation that keeps me grounded and understanding that sports is just that, “the toy department of life.” But man! This is a tough one for me. I have a grandson that is pure joy, and I’m blessed that he lives in my home. 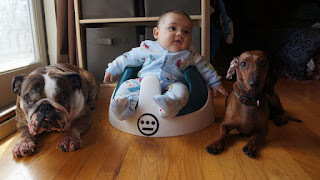 His name is "Hiero." A unique name that he was given that even makes him more special, in my opinion, because there is definitely only one Hiero out there. I have to say, this kid is cute. I don't just say that because I'm his grandpa. I say it because he really is a cute baby. Probably the cutest I've ever seen. I'll let you judge, the pictures don't lie. When I get home, I can spend hours playing with that little guy. He just wants to be tossed in the air, jump up and down, laugh and smile. His laughter makes my day. His funny faces and gestures are hilarious. When he cries or he’s sick, he has a wail that melts your heart. I could easily say that being with that little boy is the highlight of my day. Here's my dilemma...he’s going to be the biggest Giant fan on the planet and there’s absolutely nothing I can do about it. Hiero and his dad Carlos, posing in front of McCovey Cove. 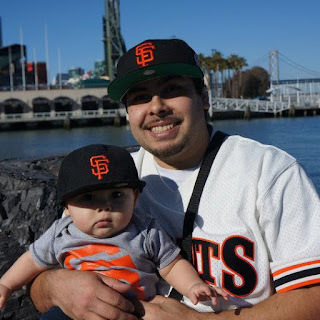 You see, Hiero’s dad is about as big of a Giants fan as I'm a Dodger fan. So big a Giant fan that he has this big ugly tattoo of the Giants logo across his back from shoulder blade to shoulder blade. Over the years, I have been able to keep the rivalry in check in our household. I’m able to keep quiet if the Dodgers beat the Giants. I can’t say the same for Carlos, but I think he tries to be civil with me. There's a mutual respect and additionally, we like each other too much to really lay it on too thick. Each of us live and die with our team, and we each know it. I try to take the high road when it comes to the rivalry. And what can I say? The Giants have had the better of us for a few years. There hasn't been much to brag about. So sadly, my love for the game I won’t be able to share with my grandson, because he’ll be a Giant fan and naturally he’ll be taught to hate all things blue. In fact, I’m pretty sure that the blue outfit my wife bought for him today will be exchanged or returned because...well, it’s blue and that color is usually taboo in Hiero's wardrobe. Sure, I could go out and buy him Dodger stuff, but his parents will never allow him to wear it. There's no point in it. The boy is doomed to wear orange and black (and 49er red to some extent too). When his dad painted his room orange and black before he was born, I knew it would be a lost cause to bring him over to the blue side. Truth is, I couldn't do that to his dad either. He's a good man and it simply would be wrong of me to attempt to convert his son to Dodger loyalties. What can I say? There's nothing that can be done without starting a war in the household. So now that Hiero's dad is starting to plan his first birthday party, which is 5 months away. He's picked the theme. Yes, it'll be a San Francisco Giant theme. And guess what? He wants to celebrate his birthday at AT&T Park. Of course, they are playing the Dodgers that day too. And for the party...for a fee he can have an appearance by that annoying Seal mascot. Wonderful. If I show any sign that I'm a Dodger fan, then the hatred will come out against me like a vengeance. The Seal will badger me to no end. So I'll lay low and keep quiet though inside I'll be enduring all those ugly Halloween colors. Can't we go with a G.I. Joe or a Clown theme for his birthday? Come to think of it, why do birthday parties have to have a theme anyway? He'll be one year old. It isn't like he'll remember any of it. Well maybe he will. When kids endure extreme trauma, they usually remember it. (OK, that was cruel, but I couldn't resist). Man, I hate the Giants. With that said, I’ll move on to baseball and Dodger news. Eric Stephen at TRUEBLUELA.COM writes that Carl Crawford expects to be ready by opening day and that he is already tossing the ball around, at 45-60 feet distance. That’s good news. He says that the only set backs have been some soreness attributed getting his muscles back in throwing shape. Also, Crawford reports that his wrist injury from last year will have to be watched. Carl is said to be using sliding gloves for when he runs the base paths. Once again, the head first slide injury risk raises it’s ugly head. Why can’t guys go in feet first anymore? Also, Crawford is claiming that he has no issues batting first in the lineup. More good news is that Ronald Belisario is in camp and has been for several days. Maybe Belisario has learned his lesson and matured. With his release from his Venezuelan Winter League team during the season, things didn’t look good in that aspect, but Belisario seems to be sincere in his attempts to remain a major leaguer and to capitalize on a potential big pay day. 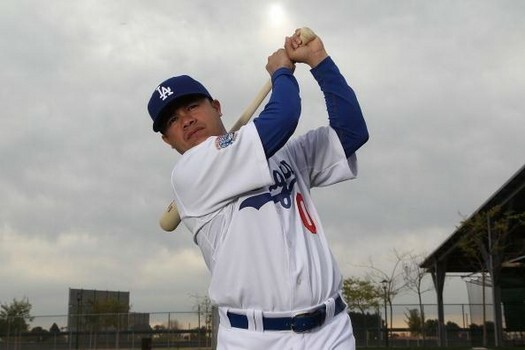 One of the Dodgers biggest surprises in 2012 was the emergence of Luis Cruz as a clutch hitter in the Dodger lineup. A journeyman minor leaguer, Cruz was an average AAA player, with a career batting average of .261 and a poor on base percentage (.296) over nine minor league seasons dating back to 2001. When Cruz was called up to the Dodgers on July 2nd, it would be safe to say that not much was expected from him. Though his numbers were good in Albuquerque, it was still Albuquerque after all. He was a 28 year minor leaguer with some major league experience. Perhaps he could contribute a little bit, at least until the trade deadline or when Dee Gordon’s thumb injury healed up. What Cruz did wasn’t anything that anybody expected. Except for Luis himself that is. Starting off on a 7 for 19 tear, within three weeks chants of “Cruuuuuz” greeted him as he stepped to the plate a Dodger Stadium. He had become a fan favorite. San Francisco Giants broadcaster Mike Krukow spoke of Cruz’s success when the Dodgers came into San Francisco and swept the Giants in late July, saying he doubted that he’d be able to keep it up. He was, after all, an unknown commodity and career minor leaguer with a .260 average. He said that the league would get him the second time around. He had never thrived in his few stints in the majors the last few years, having hit .221 in 154 lifetime plate appearances with the Pirates and Brewers. What wasn’t known was that Cruz had made some remarkable adjustments during the 2011 off season. He was working hard with his dad in Mexico, Luis Cruz Sr., a well known and respected Mexican League outfielder who has Mexican League Hall of Fame candidate credentials, (.297 lifetime average with 210 homers). That he was hitting with some pop and his aggressive approach at the plate was getting some success. 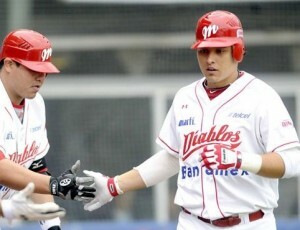 He turned some heads by going out and hitting .406 in the Mexican Winter League with the Mexico City Red Devils. Luis signed with the Dodgers in November 2011 during that Winter League season to a minor league pact, believing that he had a real legitimate shot at cracking the opening day roster with the big club. That was until Ned Colletti signed Jerry Hairston Jr., and Adam Kennedy a few days later. He had just turned down a lucrative offer from a Japanese League team. He also passed on contract offers from the Marlins and the Giants. “The Dodgers looked like the best option for me,” he said to Anthony Witrado of The Sporting News, when he was interviewed this past August. Had Kennedy and Hairston been signed first, there is a pretty good chance that Cruz wouldn’t have been a Dodger. He may have actually been patrolling the infield in San Francisco instead. Out of Spring Training, due to the annual game of roster slot numbers, Cruz was sent back to AAA Albuquerque and there he went and simply played very good baseball. With a stat line of .318 BA, .348 OBP, .877 OPS, 8 homers, 46 RBI in 289 at bats. The Cruz call up was well earned and overdue after the Dodgers offensive woes were historically bad in late June. 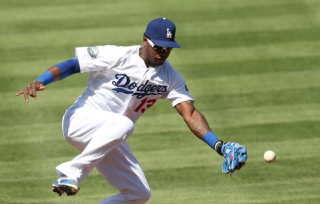 By the time Dee Gordon recovered from injury, Hanley Ramirez had already come over to the Dodgers via trade. By then Cruz had played himself into the starting lineup for good. He proved consistent during his entire three months as a Dodger and now enters the 2013 season as a favorite to start at third base. Cruz returned to Mexico a hero this off season, being recognized in his hometown in Sonora with a day in his honor. He then went out and played a lackluster three weeks in the Mexican League. Playing third base for the Tomateros de Culiacan, Luis collected 75 at bats and hit .173 with no homers, 3 RBI and OPS in the .300’s. Could it be fatigue from too much baseball over 12-14 months or is it a sign of things to come. Never a player that works counts and walks much. Cruz is what he is. A free swinging hitter that often takes hacks on the first pitch. Those saber metric followers of the game aren't impressed with him. Those fans that look for intangibles love a player like Cruz. He catches the ball well. He makes the defensive web gems. His aggressive approach was successful last season. There are those that believe Cruz is possibly a 20 home run guy with the opportunity of playing a full season of major league action. 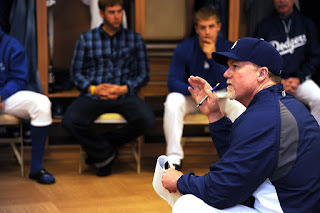 Recent blog sites show Cruz working with Mark McGwire and Adrian Gonzalez this off season. Enthusiasm is rampant with Dodger hitters believing that McGwire will make a difference to the team this year. Hopefully that is true. Truth is though, third base is still the biggest question mark on this club for position players and it's because history has shown that players like Cruz don't simply emerge out of nowhere into their 10th season of professional ball. It's a great story that he did. Can he keep it up? That's the big question.